There are two important dyadic principles that originate in the Supermind: Knowledge vis-a-vis Will; Space vis-à-vis Time. It would be interesting to study their unfolding from an undifferentiated and unmanifest mode to a differentiated mode in the manifestation. The transition from the undifferentiated mode of Reality to the manifestation is indeed an enigma, a logically incompatible situation. Sri Aurobindo unravels an array of poises to understand the transition and unfolding of the dyadic realities. 5. Poise E: The poise of the actual manifestation (there are also subordinate poises between the Supermind and the actual manifestation). At the poise where Reality is perceived as an Absolute and unmanifest Sachchidananda, there is no differentiation. In fact, the Absolute is a pure Unitarian Consciousness where Sachchidananda or ‘Existence, Consciousness-Force, Bliss’ being an undifferentiated triune, ‘Consciousness-Force’ cannot cast itself out in any kind of extension. In such ‘a timeless and spaceless concentration of Sachchidananda in itself’ there can be no creation and if the universe is contained at all, it is contained in ‘eternal potentiality and not in temporal actuality’ (The Life Divine, pg158). The yogic realization of the undifferentiated poise of Reality is a great spiritual discovery that if viewed in isolation as the sole Reality would lead to the interpretation of the manifestation as an illusion. However in the integral vision of Sri Aurobindo, the unmanifest Reality has equal value as the manifest Reality. The next level of Reality (Poise B) is the primary poise of the Supermind which contains the creative idea and vision as an in-built program, a divine archetype or a ‘Real-Idea’. Here also Reality is present as an unitary consciousness though containing the idea of creation that automatically implies the phenomenal potentiality of multiplicity. The skeptic may argue that it is logically incompatible for the unitary essence to accommodate the idea of multiplicity. 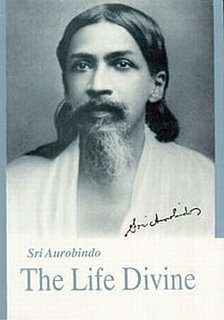 Sri Aurobindo argues that when a single individual harbours multiple ideas, one does not sacrifice individual uniqueness! ‘Somewhat as the thoughts and images that occur in our mind are not separate existences to us, but forms taken by our consciousness, so are all names and forms to this primary Supermind. It is the pure divine ideation and formation in the Infinite, -- only an ideation and formation that is organized not as an unreal play of mental thought, but as a real play of conscious being. The divine soul in this poise would make no difference between Conscious-Soul and Force-Soul, for all force would be action of consciousness, nor between Matter and Spirit since all mould would be simply form of Spirit’ (The Life Divine, pg 158). In this Primary, comprehending poise of Supermind, all is one, not many, there is no individualization. It is an equal self-extension of Sachchidananda, all-comprehending, all-constituting, all-embracing. The ‘All’ is held in the matrix of unity as forms of the one existence and not as separate existences.